Welcome to an amazing show where sport and fun are “king & queen” in three hours of action-packed supercross racing and stunning freestyle motocross tricks. 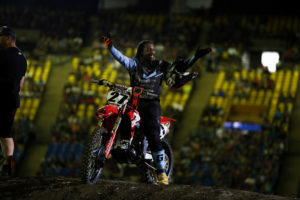 Because when you see more than ten motocross bikes in front of you, flying on the triple jump section, reaching eight meters above floor level on a 20-meter long flight, remaining indifferent becomes impossible. Because watching the world’s best freestyle specialists perform their endless range of breath-taking flip tricks, amazing “whips” with the bike reaching a full horizontal position… or “body-varial” tricks where both bodies and bikes flip will make you raise and even shout. 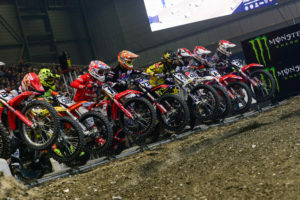 Because a full-speed overtaking manoeuvre on the dubbies section followed by a blocked-pass on the banked corner can only be seen in supercross racing. Barcelona Supercross is the best example of how thrilling and how fun a motorcycling event can be both on the track…and on the stands. In the Palau Sant Jordi arena entertainment has no limits: massive “Mexican waves” performed by the crowd, chainless deafening chainsaws, big home-made banners to greet and encourage the riders… and drums and bass drums instead of pop-corn buckets. Everything is huge and everything is different in Barcelona Supercross. 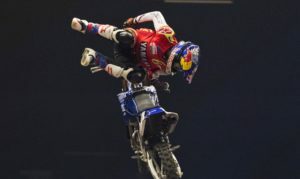 Even riders said: “what happens in Barcelona Supercross… only happens in Barcelona Supercross”. And we should add: “and stays in Barcelona Supercross”. Now it’s time for you to experience it!